After Effects CS5. It will be a life saver." Art Holden, Presenter Media Inc.
Current AE Link version works with Lightwave 11.0.3 and higher but not including Lightwave 2018 as well as all After Effects releases from 7 Professional to CS3-CS6 and all CC releases up to CC2014. It fully supports Lightwave's dongle-less licensing system. Tested both on Windows and MacOS. Please note that Auto Sync does not work properly on OSX Mountain Lion (or higher OSX version) regardless of AE / LW versions. Everything else works properly on all platforms and software releases. Volume discounts and studio licenses: discounts are available and custom licensing can be arranged — see the "In-Depth" tab for more informations. Details: AE Link is delivered as digital download only. Tech support is handled by our online trouble ticket system. Minor version upgrades are always free. Watch the videos in the "In-Depth" tab above. The longer video showcases the custom objects' workflow. Custom objects allows to create and edit After Effects layers inside Lightwave. Other videos are available, showing the pixel perfect matching, basic workflow and quick start. To purchase AE Link use the Buy Now button below. The entire purchase and licensing system is automated, so you are just a minute away from using AE Link. This product includes: AELink plugin for Lightwave 3D, licensed for both MacOS and Windows. System requirements: Lightwave 9.6.1 or higher upto 2015.3 under MacOS; Lighwave 9.6 or higher upto 2015.3 under Windows. After Effects 7 Pro up to CC2014. (MAC only: Automatic Sync does not work on OSX Mountain Lion or higher, Manual Sync has no issues.) License is tied to a single Lightwave's product ID and a valid product ID is required (either software or hardware). The following videos showcase some of AE Link's features. More complete tutorials are coming. Please also have a look at the manual (in the Downloads tab) before purchase. Please contact us with the number of licenses you need and we will send you a special purchase link. For more than 25 licenses, a very cost effective flat-fee studio-wide license is available. A licensing systems not tied to dongle ids can be arranged as well at extra charge. Please contact us directly with your requirements. The contact form is in the Support page, here: contact form. Existing customers should login in their account and open a support Ticket from the Dashboard because tech support is only provided to valid licensee. In order to obtain a perfect match, animated items in After Effects require a keyframe for each frame — a process called baking. Baking is a cumbersome and potentially destructive operation, that's why AE Link applies soft baking without altering the Lightwave scene. Soft baking can not work on items driven by IK or motion modifiers applied after IK in the Motion Options panel. Need render or not ? Didn't need Rendering in Lightwave before sync to AfterEffect? Plug-in AE_Sync_Scene failed to start? Help! I'm very excited to use this plug-in. Unfortunately I am getting an error in lightwave (plugin AE_Sync_Scene) and (Sync_Selected) failed to start. I am using After Effects ver 5 with a current update. sorry to hear that, a new version of AE Link mac is available that fixes a few compatibility issues and adds support for 9.6.1. I also wrote you an email in case you are not on Mac. Thanks for choosing AE Link! Thanks for your quick reply. I have the plugin working now. Hi there! Very much interested in this but would like to know what is not supported by the plugin? I assume it supports both free and targeted camera (camera looks at target in LW). Does it support complex parenting of cameras, IE (camera parented to null, null is animated to drive camera motion etc). Does it support motion modifiers such as having the camera match orientation of another object, relativity, expressions, follower and the "same as object" rotation options? Thanks so much, really looking forward to getting this! Re: AE Link motion limitations? problems. The only limitation is with "After IK" motion modifiers. such as relativity) require baking. AE Link can't see IK nor anything that is applied "per frame" unless it scans the entire animation. default method that does no scanning. projects? Thanks so much, really looking forward to getting this! addition. Not seamless, but works well and it's pixel perfect. Does AE Link have Lightwave 10.1 OSX comparability? Re: Lightwave 10.1 OSX compatibility? yes, sure, Mac is supported both in 32 and 64 bit and AE Link is 100% compatible with Lightwave 10.1. Actually I develop on Mac then port to Windows. Works great with LW 10.1! So glad we found this. It worked great installed on a PC with Lightwave 10.1 and After Effects CS5. It will be a life saver. So I ended up buying this for an upcoming project just a couple of days ago and I did a first run with it today. This is simply amazing, you have saved me hours of work, but more importantly opened doors to much more creative options, ones i didn't want to explore before due to the slow nature of matching up motions. It makes it feel like AE and LW are now one program. Thank you! Hey thank you. Glad it's useful. Just bought this and while the install seems it should be a snap, when I install it, it does not create this cfg file and so I can not import the branch. When I add the plugins, it does it, says 6 plugins have been added. Can't get past that. sorry for the problem and thanks for choosing AE Link. The menu config is a separate download ( http://www.vfxwizard.com/downloads/aelink-menu-cfg.zip). I'm also going to email it to you. This should fix the issue, if you have any other problems or if I misunderstood the issue please let me know. Registered Users: if you need tech support, please use the ticket system in your Dashboard, it has the highest priority. AE Link sounds like an amazing plug-in. Does AE Link allow for bi directional syncing of scenes from AE to/from LW? We current use Camera Tracker (The Foundry) to for match-moving. We typically track in AE and then send the data to LW vby jumping through a few hoops. After seeing a few YouTube videos on AELink, I was wondering if we could use your product to make this process easiest. Here is what I would be tring to do wit it. 2. We would then use AELink to send the 3D scene to LightWave where we would add 3D geometry/ etc and render 3d elements for our composite. I'm very sorry but somehow your comment was published and I wasn't notified. Nor could I find your email, so I can't reply. Just in case you read this, bi directional sync is coming. I don't have first hand experience with The Foundry's tracker, but it should work even with the free AE to LW script. Sorry again for missing your comment! Just purchased this - and it works brilliantly. I wanted to thank you for making such an awesome piece of software - great work guys! But I also echo others when I say that bidirectional linking would make it so much more useful. Even if it's not a "live" link - one way only to either app - it would be so useful for my FX work if I could send camera data from AE to LW as easily as I can the other way around! Currently you can make use of the free script available from aenhancers (AE Link has a compatibility setting for that script). Bidirectional sync is already in next version, but it won't be as seamless as going from LW to AE is. There's no standard way to control LW from AE, while the reverse is true. Hi there, I've just noticed that if your LW scene is set to only render a single frame in your sequence, the AE script fails and usually crashes After Effects. Something to fix in the next release maybe? I wasn't able to crash After Effects this way, but using 1 frame long exports I got the warning. Makes sense as AE Link uses a workaround to open AE comps from scripts, creating a very short preview. It's an easy fix, again thanks for reporting it! I've got a problem with AE Link. Plugin lost connection between LW and AE. I think after upgrading my OSX 10.7 to 10.8. When i try to "sync scene" or "sync selected" nothing happing. No errors. AE Link config untouched. I use LW 11.0 with AE CS 5.5.
if this happened after upgrading to Mountain Lion, it's likely to be due to the "sandboxing" that Apple has imposed to apps and cuts out the ability to communicate between them. The quick fix, for now, is to go to AE Link's config and set Export Method to "Manual", then use Run Script from AE. BTW, from your Dashboard you have access to the Trouble Ticket system for tech support: it's way faster than comments. Great program. I use it all the time now, but I do have a problem that occurs if I've sent some stuff from Lightwave to after effects, then try to sync a completely different scene in lightwave. Any previous comps in AE that have synced elements get messed with. Nulls disappear, camera information is rewritten, etc. Since this is a completely different scene, different render, etc. I'd think that it should only touch the new comp it's creating for that render. I'm using v 1.10 64bit PC, sending to either CS5 or CS6. there can be only one scene synced at a time (in the current version). AE Link does some filtering to create a single null (the AE LINK MASTER NULL) in the solids folder, regardless of how many nulls are in the scene. This helps a lot when you have many nulls (such as in a 3D tracked shot). The workaround I suggest is to rename the masternull after you have synchronized the first scene, this breaks the connection and you can sync the second scene. AE Link 2 (that was delayed due to some unexpected issues) addresses this limitation allowing to sync as many scenes as you want at the same time (with slightly reduced performance). Thanks for your kind words and for the report! Hi, AE Link looks amazing!!! -About compatibility, my After is CS6, my LW 11.0, and my Mac OSX 10.8.2. Is there a problem with mountain lion? -I'd like to use the final AfterFX projects in other machines, like a template. Will be needed the plugin installed there too, and/or LW? Or the project freeze/create the keys, like a light bake??? right now there is an issue that only affects Macs with Mountain Lion. AE Link works properly but Mountain Lion prevents the Lightwave app from talking to After Effects via AppleScript (this is a Mountain Lion security measure). I'm currently working on a fix, but meanwhile the autosync is not working on ML Macs and requires manual sync (import .jsx file with Run Script). Every other Mac OS version (and PCs, of course) work without problems. As for the baking, you are correct: once a project has been synced it's baked data. You can move it around as much as you want. i just recently switched to AE 6 and since that the program does not seem to work anymore, i can install the branch and everything but the buttons do not react, is there a way to get this plugin running under mountain lion? Thanks for your reply, i really need to get this working again, its such a great tool i dont want to miss in my workflow anymore, thanks in advance. it's not After Effects CS6, it's Mountain Lion. Please see the above comments - right now (on Mountain Lion only) automatic sync is not possible because OSX prevents apps from talking via applescript. You have to use the manual "run script" method, until I am able to provide a workaround, sorry. Registered Users, please use the ticket system in your Dashboard for tech support, it has the highest priority. Hey There. I love this plugin, but I am running into an issue where I have a null attached to the end of a letter, and in Lightwave the null stays fine, but when I bring it into AE, it looks right at the beginning, but when it gets close to it it becomes obvious it is not attached to the letter. Ideas? Max, I'm very much looking forward to the next point upgrade you announced. I am also wondering if there is any major advantage to your system and the one currently built into LW 11.5, I still haven't used the LW native version so don't know if it is as easy to use as AELink. I know AE Link 2 is late, but new versions of both AE, LW and OSX keeps getting released. Looks like the situation is stable now with CC 11.5 and Maverick beta available. 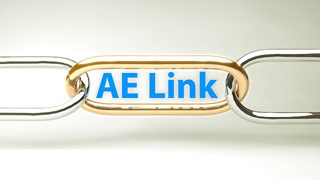 Just to be sure... AE Link is still supported and developed. So... soon, soon, soon. Well it's almost Christmas and I was wondering if the new version of AE Link is closer to release? Just to let people know that you can still use the current version in LW 11.6 and AE CS 6, but once you have exported the LW scene, you might have to go into File / Scripts in After Effects and open 'Run Scripts File' and look for the AE Link scene located in the same folder you would have saved your Lightwave scene. Then click on the file which will have the same name and it opens up in AE. I just installed AE Link following your online video and menu, but can't send anything: Camara, Light or Null from LW to AE CC using AE link. nothing happens when I click AE Sync Scene or Selected. I was wondering if there was any news on an update? It's still and relevant and excellent plugin. Unfortunately, this plugin DOESN'T WORK ANYMORE with LW 2015 / AE CC2017 under OSX (sierra). Please release an update, even if paid, because this was a really useful link between the two apps. I wish to try this! Does this plugin works 100% with these versions? Do you have a demo I could try before I buy? From this section you can download the products and additional files such as manuals or samples. For premium content, some or all files may not be available unless you have purchased the content.